Veils provides four VCAs with an adjustable response curve. 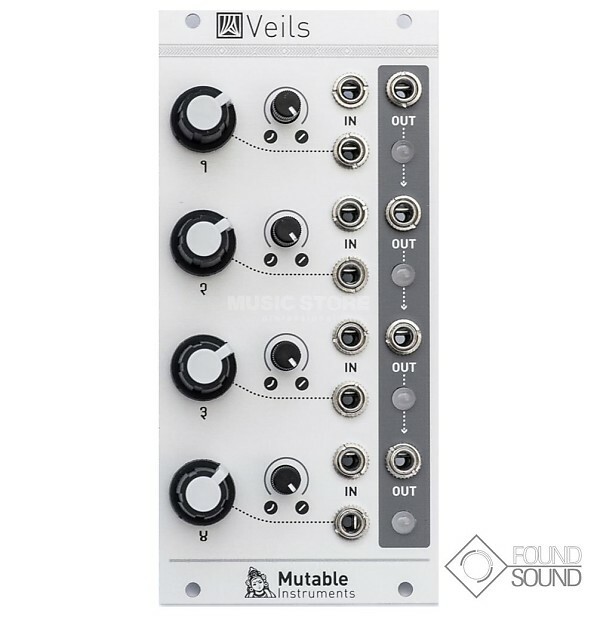 Veils’ outputs are daisy-chained, allowing adjacent groups of 2, 3, or all 4 channels, to be mixed together. All inputs DC-coupled. All inputs handle audio-rate signals. Input impedance: 100k for all inputs. Gain scale: a +5V CV translates to a gain of 1 (0dB). Gain range: 2 (+6dB) in linear operation, 10 (+20dB) in exponential operation. 12-HP. Current consumption: +12V: 50mA ; -12V: 50mA.